Queensland is home to heaps of healthy foods! While not everyone has joined the healthy food bandwagon, the state has put a lot off effort behind promoting healthy lifestyles and diets and the benefits that go along with it. There’s the Happy Healthy Queensland Government website for example, which has plenty of helpful tips and information. Eating healthy doesn’t have to be bland and boring. Queensland has many healthy foods that can nourish your body and give you a delicious meal. In this post, we share some healthy food picks. Queensland is a great place for growing a wide variety of fruits and veggies and there is also abundant seafood and fresh shell fish to be found. For this reason, there are many healthy foods which you can only find in Queensland. Here are some of them! Pineapple – one of the most abundant fruit in the region; Queensland pineapples are especially sweet and juicy. They’re also packed with vitamin C, fibre and potassium. Brassicas – cruciferous veggies such as broccoli, cauliflower, and Brussel sprouts are plentiful in Queensland. Sweet potatoes – you can find lots in the Brisbane and Rockhampton regions. This vibrant coloured veggie is rich in fibre, vitamin A and antioxidants. Tomatoes – can be found all over Australia and they are available all year round. Tomatoes have a high lycopene content which is good for cholesterol regulation. Cocoa – is most abundant in Queensland. Cocoa is rich in flavanols which is great for the heart and blood pressure. Australian Barramundi – this large, white flesh fish can be found all over Queensland. It’s rich in omega-3 which is good for the heart. Rocket – a healthy herb found abundantly in Queensland. You can grow it in your own backyard or garden. It is rich in vitamin A and K, as well as antioxidants. Pearl meat – a delicacy that’s rare in other parts of Australia, but you can find it in Queensland. Only small amounts of pearl meat are harvested every year from non-pearl producing oysters. Pearl meat is rich in omega-3, vitamin A, E and K, iron, calcium, magnesium and more! 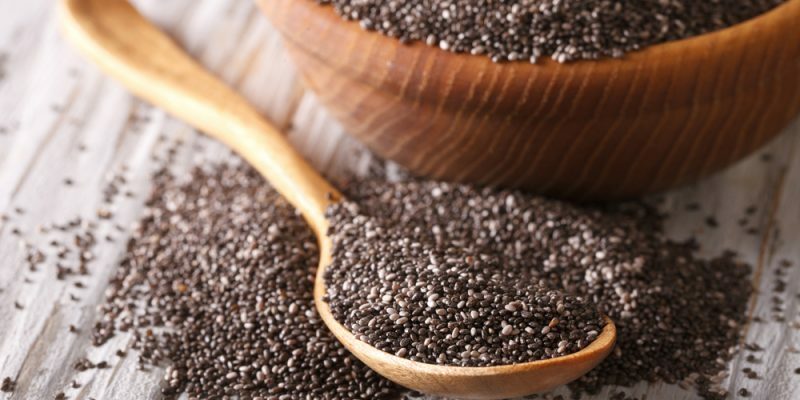 Chia seeds – Australia is actually the largest producer of chia seeds in the world and a large percentage of it comes from Queensland. This superfood has high omega-3, calcium, magnesium and fibre content. Moreton Bay Bugs – also known as flat head lobsters, Moreton Bay Bugs are full of protein, very low in cholesterol and have next to no fat. Black Sapote – this fruit is rare in Australia, but it’s locally grown in North Queensland. It’s full of Vitamins C and A, antioxidants, fibre and calcium. One of the Australian Government’s top priority is the health and well-being of its people. In this regard, the Australian Dietary Guidelines was created. This commission advices Aussies what kinds of foods and recommended amounts to eat for better health. With abundant produce, Aussies can choose from a wide variety of vegetables, fruits and seafoods. Physical activity, eating more of the important food groups and food safety during preparation is also emphasised. The Australian Guide to Healthy Eating has all the information you need to start eating healthy and good food. To fortify the efforts of the Australian Government, the local government has created programs in the field of diet and nutrition. They have everything available, such as the recommended daily intake of different nutrients, dieting and weight management, body image and vitamins and mineral supplements. You can also find a dietitian if you need one. Make sure you check it out here. Cannon Logistics provides general and refrigerated road freight services in Queensland and Northern New South Wales. You can see the areas we service here and our booking form here. we will call you to confirm your booking. Cannon Logistics Pty Ltd (ABN 64 118 875 291) is not a common carrier.